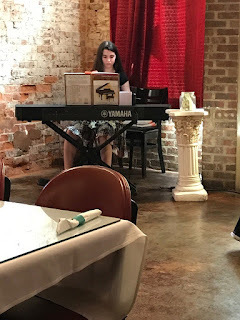 My husband and I had it in our minds for the past few years that the Princess might play piano at a local family-owned restaurant about five miles from us. It is in a historical downtown of a tiny town and when I say tiny, it was just a a handful of brick store fronts at a passenger train stop that closed down long ago, but this is the only restaurant that has stayed in business in that area for several years. It is has an upscale quality with Italian and Greek cuisine, but not too expensive for the area. We were hoping to do this last summer, but the Princess was still dealing with some self-esteem issues that, thankfully, seemed resolved now. Since then she has begun to love piano again, especially after winning first place in the Fine Arts competition for Georgia and she was highly motivated to earn some money towards the trip for the national competition. It was estimated to be about $3,000 with one adult and one child, however my husband has sky miles, so the flight may not cost us much or anything at all, and points he could possibly use at a hotel, but they are all booked, so maybe not. Being that it is costly, we began talking about a summer job for the Princess. Our Youth Pastor hoped to have the Princess work at the YMCA along with her to be a counselor for kids at their summer camps, but the jobs were filled before she was given the information on how to apply. Although she thought it would be better to have an income that was more certain than hoping for tips, it would have been inconvenient because that particular YMCA is a distance from us and coordinating the hours and days with transportation along with the Youth Pastor, who has had her focus more into her new marriage, seemed unlikely to go smoothly. I was actually relieved when the YMCA door closed, because I felt it was not a good fit for us and I keep hearing my Lord telling me He is going to bless us. So, my husband contacted the restaurant owner and showed him a video of the Princess playing for the Fine Arts competition—on the piano with sticky keys, no less. Still, he was impressed enough to say that he would like to interview her. She was to call him and set up an time for that, so she did and he said he would call her on the following Monday to have her come for an interview, but Monday came and went without a call. Coming back from her piano lesson on Tuesday, I had her call him and take the humble approach that she night have misunderstood him about who was to call on Monday. He did not remember her at all at first, which I took as a bad sign, but then he remembered and just asked her to come on Friday and Saturday night to play from 6:00 p.m. to 9:00 p.m.
Now the Princess usually only juggles two to four harder songs at a time so this was going to be a real challenge to prepare several to play for 30 to 40 minutes without repeats. We had already been preparing her by picking out songs she had done over the years, simpler yet quite lovely for background music at a restaurant. She was also coached to play harder songs more current, but at a slower pace and to condition herself to play for a longer time because the longest time she performed for recitals has been less than ten minutes. I knew she could do it, but...well, I am a mother, who felt she was not really prepared, but if she wanted to pull it off, she would because she does have that performer gene. I had left for Florida on Thursday morning that week and returned home on Monday, so I was not there for her first time. When my husband sent me this picture, I suggested that she use her black music folder to hide the books and look more professional. However, the Princess called me to say that she had been given $64.50 on the first night. I was blown away! I thought she might make something like $20-$40 maybe. This was on a holiday weekend and the first one after school was out, so many people go away or are having cookouts. Previously, I had told her that even though it might not be as predictable as a regular paying job that she might make more money in tips overall, but I did not expect it would be that much! The next night she called to tell me she was looking at $115 in front of her right then and I first assumed that she meant for both nights together, but then it caught me and I asked, "You mean that is the money you made tonight alone?" Yes, the owner had given her $30 of it but the rest was all from customer tips. When I talked to my husband, I found that he also thought she meant altogether. So for playing relaxing music for six hours she made $179.50 that weekend. That comes to just about $30 an hour! When I had returned home, the Princess told me how she kind of felt bad, because the busboy had told her how many hours he works and what he makes, but she was wise enough not to say anything about what she had made. I told her what I have always told her: A job that can be done with little training by anyone they pull off the street is never going to pay as well as the job that requires training. She said all she did was sit and play, that it was easy. (This from the girl, who for three years begged to quit and brooded when we would not let her.) I told her it was easy because she has had years of training with thousand of hours and thousands of dollars poured into that training. She brought it up again and her father and I just smiled at each other, and he said, "The best job in the world is the one that does not feel like you are working at a job." The secret meaning is that she loved it, so it does not feel like work. My husband and I had dinner there on Friday evening. It was rather emotional for me, hearing my own daughter playing the piano as we had a nice dinner together. I knew this was how it could be for her, but I was not sure we would get there. This particular restaurant is in an old building that was sand blasted to expose bare brick inside and out, but the outside was painted when this restaurant moved in. (I actually had met the owner of the several of the buildings in the town when she used to run an antique store there, who told me about all the work she had done to revitalize the buildings.) My point is the bare brick make the acoustics quite good there. The restaurant owner likes to rotate performers, when others are available, so the Princess will not always be able to play there on weekend nights, when they are the busiest, but her manager (her father assumed that title) found that they did have the following weekend open, which was this past weekend. She earned $65 on Friday and $70 on Saturday. She knew that tips would fluctuate, but still she averaged over $20 an hour. Next weekend is already booked—a boy with a trumpet, which I think would be too loud for the place, but it is not my call. The restaurant owner told her that we can negotiate for other times and I think she is booked for the next weekend. 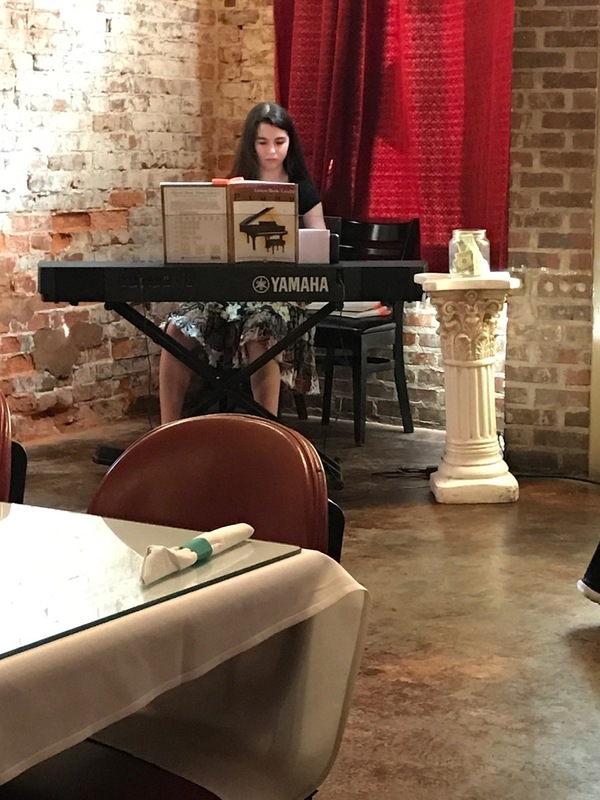 She may not make as much every time, but I think everyone working at the restaurant heard a lot of compliments about the piano music and they will want her to play often. The Princess is now thinking of continuing to play there throughout the year if they are so inclined and the family owns three of these restaurants in our area although the other two are further away, about 20 to 25 minutes in two different directions. Still, it would be worth it if she does as well at them. Actually, we do not know if the other two do live music yet, but it might be advantageous for her to rotate with them if they do, so the regular customers at the one place do not feel her playing is stale or they see her too often so she earns less. I feel like we have finally come to that "ah-ha" moment with the Princess and her piano...and Mama is very happy! My Lord, thank you so very much for getting us past the a very rough time between the Princess and piano. Thank you that she is now seeing what we had envisioned and hoped for. Thank you for standing firm with me as I felt so helpless trying to re-ignite that love she had for piano. I know that it was all in Your plan, but Your plans are not always the easiest paths to take. Thank you for this blessing of seeing the love of music again in the heart of my daughter.